How’d you sleep last night? If the answer to that question is something along the lines of, “I think I slept, but I feel so tired all the time,” then the culprit may be sleep apnea. This medical condition causes temporary pauses in breathing throughout the night. There are two types of sleep apnea. The less common is called central sleep apnea and occurs because the brain fails to signal muscles to breathe. The more common is obstructive sleep apnea, which happens when soft tissue in your throat blocks your airway. Either type can have serious health consequences including heart disease. To reduce the risk of heart disease and treat sleep apnea, Dallas residents turn to Dr. Keane Fedosky and his team at Sleep Rehab. That sleep apnea disrupts sleep should come as no surprise, especially since snoring is often a leading symptom. However, why is there a connection between sleep apnea and heart disease? When you stop breathing, for any length of time, your blood pressure goes up and the oxygen level in your blood goes down. The brain is then notified of these two occurrences, and a signal is sent through your nervous system that essentially tells blood vessels to constrict in order to increase the flow of oxygen to the heart and brain. If this only happened during episodes of sleep apnea, then there may not be an issue. However, this cycle of increased blood pressure tends to continue throughout the day. Hence, even when you are breathing normally, your heart is overworking. 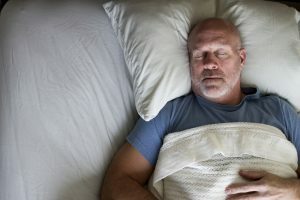 At Sleep Rehab, Dr. Keane Fedosky and his staff treat sleep apnea not only to help patients enjoy a restful night of sleep but to also avoid the negative cardiovascular consequences. Our office uses two types of oral appliances: the Herbst by Gergens Lab and The Narval by ResMed. Both of these comfortable oral appliances are made of smooth plastic and are custom-fitted for your mouth. They work by slightly shifting your lower jaw and tongue forward in order to prevent your airway from becoming blocked. Research indicates that when sleep apnea is treated using an oral appliance, blood pressure is lowered at night and during the day. If your nights are less than restful, then contact Sleep Rehab to schedule a consultation with Dr. Fedosky. You may not only begin to enjoy a better night’s sleep, but a healthier life, too.